Help CentreUsing SuperControl Managing guests, emails and auto correspondenceHow do I merge duplicate guest records? 1. Go to Database > Merge duplicates. 2. 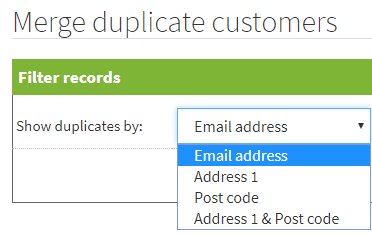 Select how you would like to display your duplicates and click Go. 3. From the results, click Edit against the record you would like to merge. Select the record which should be the main record, and tick any boxes that should be sent to the main record details (by default the system will select all the details for the main record). 4. Click Merge and OK. Now, all the records will be merged into one record. Prev: How do I hyperlink text in an email?